Is Out of Date Protein Safe to Consume? Typically made out of whey, eggs, soy and/or rice, protein powders can be used as a dietary supplement. The most common consumers are bodybuilders or athletes wishing to increase their muscle size or lose weight. The vast majority of protein powders are made out of whey protein isolate because it’s easily digestible. While protein powders certainly have many benefits, sometimes they can get left on the shelf for long periods of time – leaving some to wonder if and when the powder begins to go bad. Besides their expiration date, what is the best way to store the powder? Lastly, can out of date protein powder still be used? If there are any visible and slightly wet clumps in the powder, it will need to be tossed as the clumps may begin to grow mildew and make the powder inedible. Should the powder smell differently than is normal, or simply have that rancid smell, it needs to be tossed. When you are still unsure about the powder’s safety, place a small amount on your finger and taste it. This small amount of powder will most likely do not make you sick, but should help you determine if the taste is "off" or not – if it is "off", then it is time to toss the powder. Given that the powder has been properly stored in a cool and dry environment, it is actually safe to continue consuming the powder long past its expiration date. For approximately 6 to 18 months after its expiration, the powder will still be edible provided the proper environment has been maintained, and it may not spoil for over a year past the expiration date. 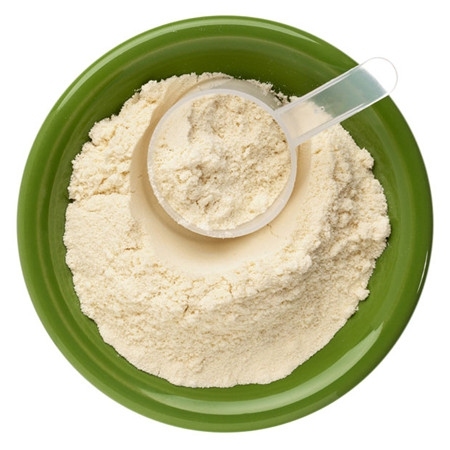 While out of date protein may still be safe, the powder first packaged is much different than the powder consumed several months after the use-by date. This is because the nutrients in the fresh powder will begin to break down and lose their original potency – meaning it will not provide the same level of nutrients that are listed on the packaging. Thus, while the powder may be good for nearly 2 years after its purchase, it is up to you whether or not you wish to consume it. Once a package has been opened, it is much more likely for moisture or bacteria to get inside. Depending on its storage, this may mean that the product can expire either on or near its use-by date. Lastly, if the protein powder contains any additional product, such as a fat, you will need to be more cautious that the fat can go bad and contaminate the powder. Proper storage of protein powder is vital to its shelf life, and actually quite simple to maintain. Once you have purchased the powder, you will want to keep in a tightly sealed container. Some powder’s come in bags, meaning you will need to purchase a separate storage container. A tightly sealed container will prevent any moisture from gathering inside the powder and creating potentially moldy clumps. Furthermore, you will want to keep the powders container away from any heat sources, such as in the pantry. On top of the fridge is not ideal because of the amount of heat and moisture collected there. Typically, protein powder is given an expiration date that is a year after its manufactured date. When shopping, you will want to check both the manufacturer and expiration date to make sure you are purchasing a fresh batch. As previously stated, when stored properly the protein powder can remain potent and viable anywhere from 6 months to a year after its expiration date. If you have expired protein powder, use a small taste test to be sure before throwing it away, so you are not also throwing away your hard-earned money.